You are at:Home»Articles»What is Good Posture, Anyway? Good posture is one of the essential foundations of every runner’s health and performance. Why does it matter? In short, to have good posture is to have a body position that is centered spatially and balanced gravitationally. It can be achieved with minimal effort through good control of the postural muscles. Having good posture changes your relationship to the environment around you and within your body, and having bad posture does the opposite. If you have a postural imbalance, that imbalance will be amplified when running. More rarely, we might try to correct our posture any way we can, resulting in a much greater effort. Posture is the cornerstone of any good running technique. With adequate posture, your muscles, tendons, ligaments, and fascia will be activated correctly. Your Achilles tendon, for example, can only build and release energy effectively if your body is leaning forward. As soon as you lean backward, your Achilles tendon becomes less effective. What else does good posture help do? Good posture allows you to breathe properly, and that’s one of the fundamentals of running. In contrast, a hunched body position is an obstacle to proper breathing. Your body can try all it likes to absorb oxygen so it can generate energy, but if your posture is hindering your breathing, you’re wasting lots of energy. There’s been a lot of fuss about our feet being asleep at the wheel when they are supported by modern running shoes. Trying a more minimalist pair of shoes isn’t the only way to wake them up, though. If you maintain good posture, your feet will automatically be more responsive. When you lengthen your spine, you stimulate all of your postural muscles, including your deep foot muscles. This is another example of how the body functions as a whole. Most running methods are founded on the principle that the first thing you need to do is perfect your foot strike. This is why some runners suffer injuries when they try to achieve a midfoot strike, because the rest of the body is not yet ready for the change. It is far better to initiate your change in technique by starting with your posture, since everything else depends on it—including foot strike. 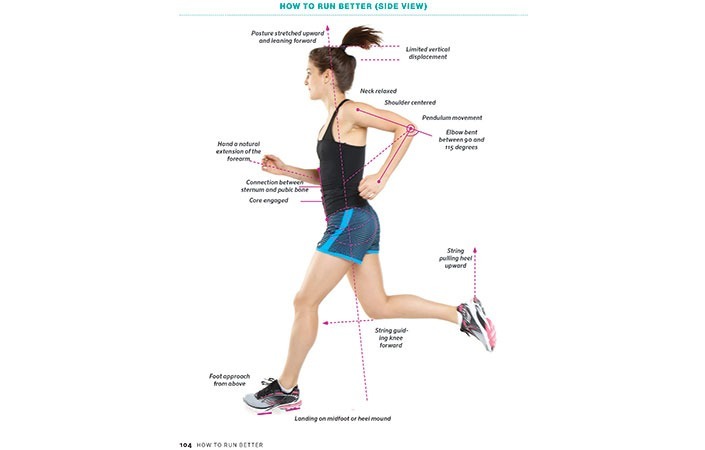 It is unrealistic to think that everyone can run with a midfoot or forefoot strike without first having good posture. The ideal running posture is the one that promotes the most efficient movement and the most natural running style, while respecting your body as much as possible. Don’t worry if your basic posture looks different from the ideal. You have your own posture, like a body signature. And there’s no reason to change everything overnight. You can gradually work your way toward the ideal without needing to achieve perfection. There is more than just one good running posture, for the simple reason that human beings are not robots. Many people find that their postural muscles are dormant and weak after years of disuse. It is important to reactivate these muscles and take back control of them. Postural exercises [..] can help you to take your running to the next level. What’s more, you’ll see the benefits in the way you hold yourself in everyday life too. Your whole body needs to be slightly leaning forward. Some runners bend at the hips and lean only their head and torso forward. […] This posture is inefficient, and it’s too demanding. You should always keep your body centered from head to toe, and lean it forward as a whole from your point of contact with the ground. It is relatively easy to improve your posture if you follow the two principles set out below. Start by standing barefoot on a flat surface. Turn your awareness to how your feet are placed. Which surfaces are in contact with the ground? Try to put equal weight on both feet. Then picture a string gradually pulling the crown of your head toward the sky. Your spine will gradually lengthen and you will stand taller, usually by a 1⁄2 inch or so (a centimeter or two). You’ll probably notice that your feet make better contact with the ground too. Keeping this more centered and elongated posture, think of your body as an upside-down pendulum. Your feet are in contact with the ground and represent the fixed end of the pendulum. Your head is the other end of the pendulum—the part that is mobile. Your straight body is free to lean forward and backward. Try this movement a few times. Do you feel comfortable when you lean forward? How about when you lean backward? And how firmly rooted do your feet feel? When you lean forward, you should feel like you’re transferring your weight to the front of your feet. And when you lean backward, you should feel your weight shifting to your heels. Finish this little experiment with your body leaning forward and memorize that sensation. When you’re running, you should feel the same thing every time your foot hits the ground. The key to having good running posture is to allow your body to lean forward, keeping the length in your spine, until you feel that your weight is beneath your toe mounds. When you feel that solid connection, you know your posture is correct. You should feel stable in that position and be able to hold it for a while without too much effort. If not, don’t lean quite so far forward and find a position where you do feel comfortable. If you feel more stable with your weight on your heels, that means you will run more naturally with a heel strike. And if you feel more comfortable with your weight on the front of your feet, you’ll know this is your natural foot strike. Now it’s time to practice. Head outside and go for a short run, focusing on your posture and the techniques you just learned. Excerpted from Run Better: How to Improve Your Running Technique and Prevent Injury by Jean-François Harvey. Published by Greystone Books, March 2017. Condensed and reproduced with permission of the publisher.